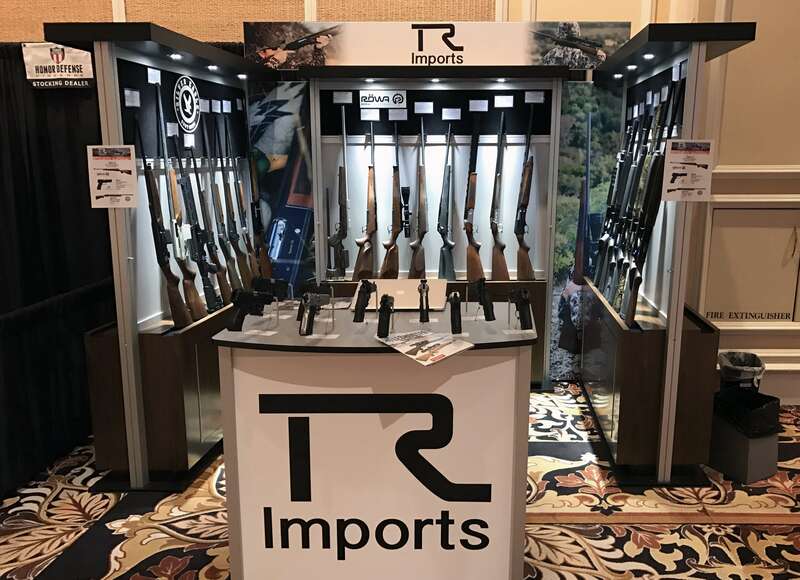 TR Imports offers a diverse line of high quality rifles, shot guns, handguns, cases, and leather goods, and handles customs clearance of firearms from a multitude of countries. TR Imports was referred to Exhibit Network by a satisfied client. The first challenge TR Imports faced was finding exhibit properties to fit into an L-shaped 10 x 20 x 10 booth space which could also be used in 10 x 10 and 10 x 20 configurations. Additionally, TR Imports needed lockable storage, counters, and displays for their handguns and rifles. Further, they also required an easy assembly because they would be installing their exhibits themselves. It took several weeks of brainstorming to finally come up with the solution that would best serve the client. Once the initial layout was approved, TR Imports sent some of their rifles and hand guns to Exhibit Network to ensure they were properly mounted to the custom displays being built. Custom-jigged crates were produced and the properties were strategically packed for split shipments to different shows. The first show was a 10 x 10 at the Big Rock West Dealers Show 2017 in Las Vegas, followed by the L-shaped 10 x 20 x 10 at the Shot Show a week later, followed by the 10 x 10 World Wide Buying Group Show the next week. Exhibit Network seamlessly handled all the shipping arrangements to get the properties from one event to the next. TR Imports raved about how easy everything was to install and reported heavy booth traffic at all three events.